Fast-rising Orlando-based garage/soul rock outfit The Sh-Booms are slated to launch their debut album, The Blurred Odyssey, tomorrow, March 22nd, via Limited Fanfare Records. The Sh-Booms have been recently making waves with the passionate single “Audible” and its accompanying video. The band has also announced a long run of tour dates that go out to the start of June. Anticipation has been high for the arrival of The Blurred Odyssey and The Big Takeover is deeply pleased to be hosting the premiere of the entire album here a day before it’s officially released to the public. The LP was produced, mixed, and edited by Alan Armitage (Boyz II Men, Ginuwine, AA Villain), co-produced and recorded by Simon Palombi and The Sh-Booms, mastered by Dan Coutant (A Giant Dog, Jawbox, Denney and The Jets), and sports maritime artwork by Mary Frances Dodd. Since their 2011 inception, The Sh-Booms have become hotly tipped in their native scene and beyond. 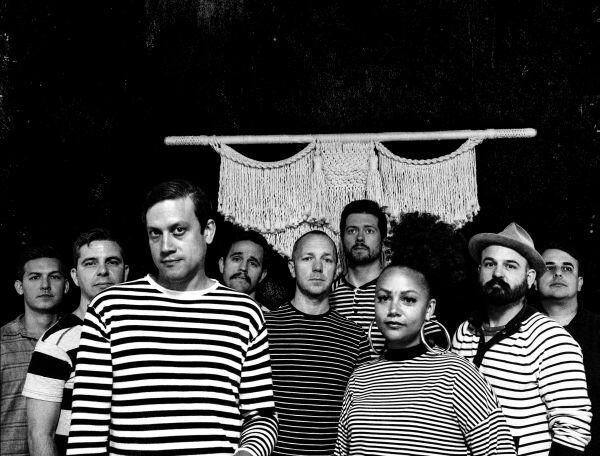 Besides perennial winners of “Best Soul Act” in the Orlando Weekly’s big annual ‘Best of Orlando’ issue, they’ve been tapped to share the stage with national names like The Roots, Of Montreal, Talib Kweli, KRS-One, Jacuzzi Boys, Budos Band, Big Freedia, Lee Fields, St. Paul & the Broken Bones, and The B-52’s (whom the band toured with in 2017 and 2018). They’ve been featured on NPR, their music has made it on TV (The CW’s Supergirl), and they’ve played Austin City Limits, Okeechobee Music Festival, SunFest, and Gasparilla Music Festivals. Since powerhouse singer Brenda Radney joined in 2015, the band’s course has been set and their date with destiny assured. She was signed to Justin Timberlake’s Tennman label, even appearing on his album The 20/20 Experience, Pt. 2. But after clicking with band leader Al Ruiz while recording separately in the same studio, she jumped aboard The Sh-Booms to turn this train into a potent locomotive. After the release of their 2016 Usage Fee EP and a huge number of shows in the Southeast, the 10 songs of The Blurred Odyssey were produced by Grammy-nominated Alan Armitage over an 18-month span that cemented the band as a tight-knit unit. That chemistry achieved then is where The Sh-Booms are now, and The Blurred Odyssey is their testament. There’s well-oiled, but exciting dynamic that churns hard through The Blurred Odyssey. The music pumps with the red, hot blood of life lived irrepressibly. But there’s also a mass of clouds looming on the horizon, the doomed sense of life’s finitude, that fuels these songs. Rather than conjuring a mood of dead-end nihilism, though, it’s resulted in the kind of urgent, creative friction that the wildly imaginative Hunter S. Thompson could get down with. In making this album, The Sh-Booms have dug through the blur of life, swam through a sea of booze, to find the essential treasures – love and truth – in the shadow of the void. Although The Sh-Booms is a soul band through and through, the grease and bite they’ve been picking up in the years leading to this big step out have been forged in the wicked-cool company of punk and garage bands. From that underground now rises a new sonic cyclone of big orchestration, maximum stomp and grind, and fresh and determined intent. There may be some battering and bruising sustained through the storm of life, but it’s mostly a rousing and inclusive celebration and appreciation of life in all its chaos, wreckage, beauty, and glory.